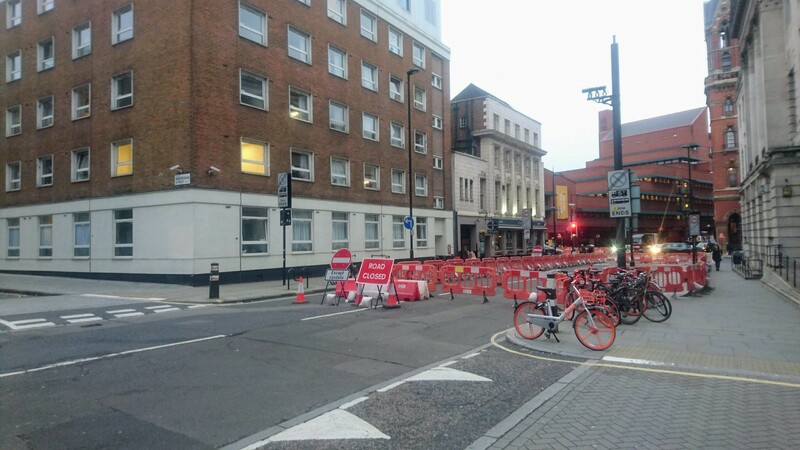 This page reports on progress with building cycle routes in Camden. Camden’s Draft Transport Strategy was consulted on in November 2018, was praised by TfL and will be adopted by the council in April 2019. We responded, expressing our agreement with the vision, our support for the seven objectives and our acknowledgment of the value of the Draft Cycling Action Plan with the plans for a borough-wide cycle network with plans for its implementation. See our map of Camden’s borough-wide cycle network showing both proposed and already built links. As described below the route on Royal College Street was built a few years ago, and Tavistock Place has been open since the trial started three years although the planned upgrades are still to be carried out. 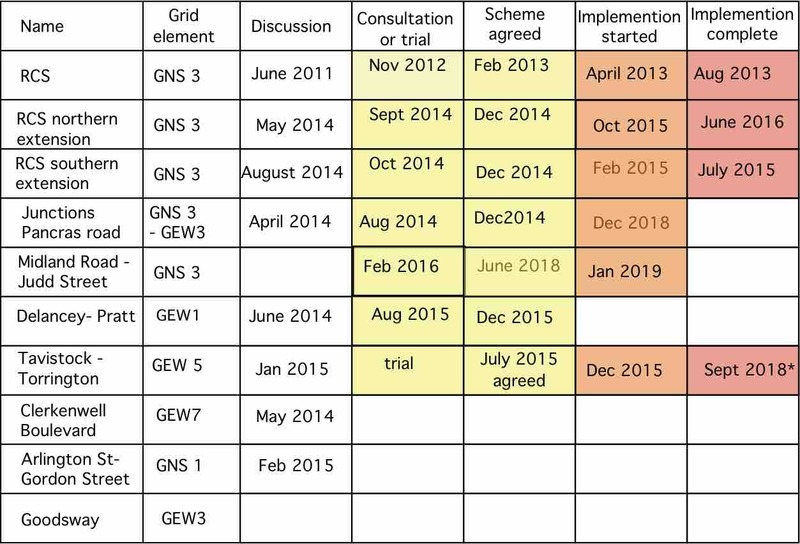 These are shown in the progress table below together with other agreed schemes. As the network develops, we will add more rows to the table. This started with the closure of Judd Street at Euston Road early in January. Read about progress here. TfL have build the new crossing over Euston Road, the pavement build outs and cycle tracks at the north end of Judd Street and a few metres of contraflow and with-flow cycle tracks at the southern end of Midland Road. Camden Council will implement the scheme on the remainder of Midland Road. Once this is finished, there will be a continuous protected cycle route from Kentish Town to Elephant and Castle via Royal College Street and Pancras Road, Midland Road, Judd Street and onto CS6. Camden has been awarded funding for Holborn a Liveable Neigbourhood in Holborn which will remove the gyratory and provide protected cycle infrastructure in Theobalds Road and High Holborn. The pages below describe the history up to the end of 2018 and will not be updated aeven when progress is made. These have been a failure because QW2 and QW3 are on roads that require filtering but cannot be filtered for various reasons. So they have not been built. CS 11: the planned route runs from Brent Cross, via Hendon Way and Finchley Road, through the Swiss Cottage gyratory, down Avenue Road and into Regents Park. It uses either side of the Outer Circle to reach Portland Place. Progress and details. Consultation on CS11 spring 2016. Consultation report available – 60% in favour. Still waiting for a decision on the gate closures, Apr 2018. Stopped by court action by Westminster City Council in September 2018 – no appeal for TfL.